France kick off their World Cup finals campaign against Australia in the opening Group C match tomorrow. The French boast an incredible array of talent and are among the tournament favourites having got to the final of Euro 2016 two years ago. READ MORE: World Cup Golden Boot odds: Neymar, Messi or Ronaldo – who is the favourite to be crowned the World Cup top scorer? The pre match build-up was dominated by the news that Antoine Griezmann has pledged his future to Atletico Madrid, after making the announcement in a television documentary called ‘La Decision’, as per BBC Sport. 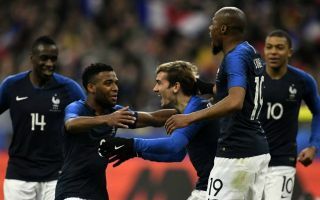 Didier Deschamps side are expected to qualify in a group that also has Peru and Denmark too, but will first have to navigate past the Australians. According to The Independent, France right-back Djibril Sidibe is a doubt with knee injury, giving young Stuttgart defender Benjamin Pavard a place in the starting XI. France could line up upfront with the likes of Kylian Mbappe, Griezmann, and Thomas Lemar in a devastating attack. Celtic’s attacking midfielder Tom Rogic is expected to on the bench for the Socceroos as per Goal, and former Everton star Tim Cahill is also in the squad. When is France vs Australia and what time is kick-off? The game will take place on Saturday, June 16. Kick-off is at 11.00am UK time. The game will be held at the Kazan Arena in Russia. The match will be shown live on BBC1 in the UK. You can also live stream the game through the BBC iPlayer. Goalkeepers: Mat Ryan, Danny Vukovic, Brad Jones. Defenders: Trent Sainsbury, Milos Degenek, Matt Jurman, Mark Milligan, Josh Risdon, Aziz Behich, James Meredith. Midfielders: Mile Jedinak (captain), Aaron Mooy, Massimo Luongo, Jackson Irvine, Tomi Rogic, Dimitri Petratos, Mathew Leckie, Daniel Arzani. Forwards: Tim Cahill, Tomi Juric, Andrew Nabbout, Jamie Maclaren, Robbie Kruse.